Our alumni are a vital part of the SHL community. Here is some brief information about them and how they spent their time with us. They are now off in the ‘real’ world doing great things. This list is in reverse chronological order. Deion Bonser joined the BHP graduate program as a mechanical engineer and is now residential at the Olympic Dam site in South Australia. A paper based on his MPE thesis (and coauthored with Alastair, Melinda and Lyndon While, title is ‘Optimizing fixed-interval maintenance periods for mobile asset sub-systems operating in remote locations‘) will be presented at European PHM conference in June 2018. 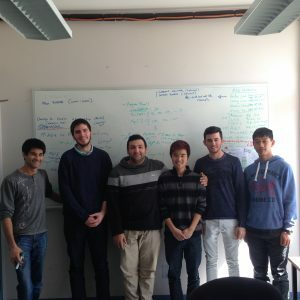 Alastair Chin joined the Rio Tinto graduate program having completed a mechanical engineering degree with a 2nd major in computer science. He is responsible for development of our Data-Oracle site for identifying data quality issues in csv files and other work as an SHL Research Engineer. He worked on BHP rail data for his MPE thesis and co-authored the conference paper mentioned above. Stephanie Lye joined the Shell graduate program as a mechanical engineer and is now working in Queensland. We celebrate Steph’s crossing the coding divide from Excel to real code during 2017 and the UWA IT group are grateful for her MPE thesis work to improve the reliability and life cycle costing the large scale desktop computer installations they manage in the labs here at UWA. Shrena Shah joined the Woodside graduate program as a mechanical engineer after a busy year setting up the SHL’s ongoing UV testing for 3d printed vs conventional materials testing program for her MPE project. She will be very happy if she never does another Instrom test for the rest of her life. Praveen Sundaram was an SHL Research Engineer for over 18 months. As one of the last to graduate with a UWA mechatronics degree. This useful degree gave him an ability to both the CAD and electronics design work that so many of our projects need. As a stalwart of the UWA FSAE car team he bought a passion for all things mobile and fast as well as the organisational skills to coordinate our squash court bookings. He now works in Henderson doing design for Legeneering . He was part of the SHL Hackathon team for the global Shield-X competition. Abdul Aziz did his MPE project sponsored by BHP on cognitive computing and then joined the BHP graduate program. He worked on two EE design projects with the SHL, the first to develop an Accelerated Life Test rig (along with Tom M. , Rohan and others) and the second to develop a MEMS-IoT mine pit lake water quality monitoring system. He was part of the Young Innovators award winning team for the 2016 Hackathon and the 2016 BHP MineHack. Ashwin D’Cruz worked as an SHL Research Engineer for over 18 months before being accepted to Cambridge University where he completed a Masters degree in Machine Learning, Speech and Language Technology. A poster on his thesis was presented at NIPS. He is now working in London developing deep learning applications for Calipsa. He was part of the Young Innovators award winning teams for the 2015 and 2016 Hackathons and the 2016 BHP MineHack. Zhihua Jia joined the Deloitte graduate program after taking a joint engineering and business degree. Zhihua (Neal) did a virtual reality project for his MPE and managed to combine his studies with running a successful tutoring business south of the river. Rohan Mehra did his MPE project sponsored by BHP on scheduling and then joined the Woodside graduate program. He was instrumental in the develop of the Accelerated Life Test rig (along with Tom M. , Abdul and others), and helped a lots with various electronic build projects. He was also part of the Young Innovators award winning team for the 2016 Hackathon and the 2016 BHP MineHack. He remains unbeaten on the squash court. Kaiden McCarthy rebuilt the drone motor test rig and did an enormous number of start-stop tests as part of his MPE project. He is now working as a metallurgical technician for Nagrom. Tom McKeon also did his MPE project sponsored by BHP and then joined BHP as a data scientist. He worked on two EE design projects with the SHL, the first to develop an Accelerated Life Test rig (along with Abdul , Rohan and others) and the second to develop a MEMS-IoT mine pit lake water quality monitoring system. He was part of the Young Innovators award winning team for the 2016 BHP MineHack. Alex Stephens joined BHP after completing his MPE project on building a reflective distance sensor for a translating and rotating context. He managed to combine practical mechanical and electronic skills. Between graduation and joining BHP he travelled around Australia and brought us back some amazing photographs. Alex Clegg continued his love of travel on graduation and is now based in Marseilles and working with Chris Breidahl and the venture capital company xponova. He build the first drone motor accelerated life test rig for his MPE project. Michael Bartle was the mechanical engineering part of the accelerated life UV-humidity-temperature test rig working with 6 electrical engineers for his MPE project. Sahil Khubchandani worked as a Research Engineer with the SHL and also an uber-tutor for GENG5507. He also did his MPE project with the Lab and produced an IEEE journal publication (Characterizing the performance of LED reflective distance sensors). He is now part of the graduate engineering program at Western Power. Tom Henderson built the first SHL web site as part of his MPE project on communicating engineering research and is the one responsible for us getting the uwa.engineering domain name. He joined Ernst & Young but remains in touch with the innovation community developing tethered drones. Linden Blair and Chris were the SHL’s first research engineers. They built the motor test rig subsequently used by Sahil and Alex for their MPE projects. Linden joined Woodside but is still active in the innovation space as one of the founders of WearHawk. WearHawk won the 2017 MineHack competition and the company is now based in the SHL. Chris McFarlane was one of the SHL’s first research engineers and left us to join the dark side (consulting). He now works for Bain and we hear he travels a lot. Callum Webb has donated a lot of time to the SHL for the Prognostics Data Library. He did his MPE project with BHP and then joined the graduate program. He was recently lured over to the east coast to work as a data scientist for APRA the Australian Prudential Regulator right as the Banking Royal Commission started. He was also part of the winning MineHack 2016 team and a founder or WearHawk.